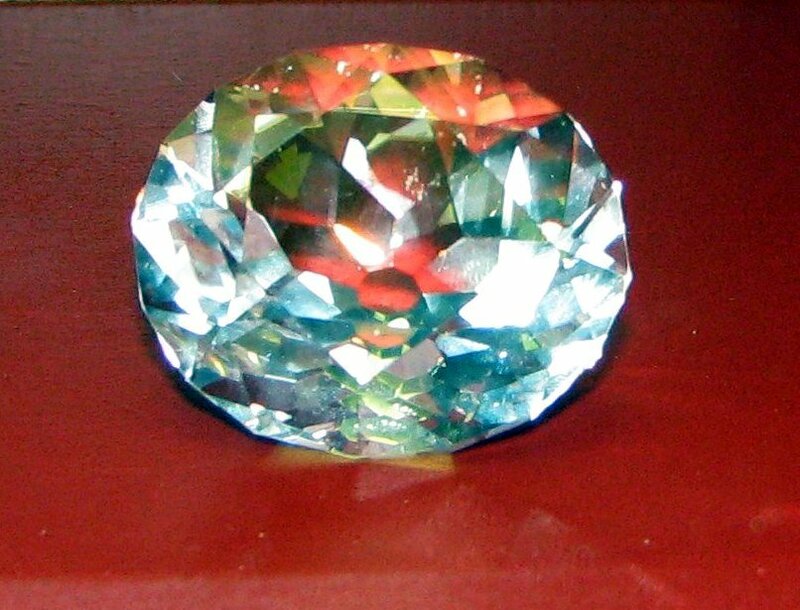 The famous diamond Koh-i-noor is believed to have been discovered in Kollur mine in the Guntur District (in at least one other reference it is believed that the diamond has been discovered in the Golconda mines in southern India). History shows Koh-i-noor was owned first owned by Khilji dynasty of India and later passed to the succeeding dynasties of the Delhi Sultanate. In 1304 Koh-i-noor fell into hands of Mughal emperors. It remained at Delhi in possession of successive Emperors, and it is said to have embellished Shah Jahan’s celebrated Peacock Throne. Eventually when Nadir Shah, establisher of Afsharid dynasty of Persia, sacked Delhi in 1739, the famous Kuh-inoor was taken back to Isfahan in Persia. It is worth noting that the current name of Kuh-i-noor was given by Nadir Shah and there is no reference to this name before 1739. After Nadir Shah’s assassination in 1747 the empire which he had funded fell into pieces and Kuh-i-noor fell into hands of the Afghan, Ahmad Abdali. He took the famous diamond to Kandahar where he set up the kingdom of Afghanistan. He adopted the name Durr-i-Dauran (Pearl of the age), from which his family become Durrani (Ahmad Shah Durrani). He died in 1773, and was succeeded by his son Timur who moved his capital to Kabul and naturally Kuh-i-noor went with him to Kabul. Following to his death, his son, Shujah Shah Durrani became the next emperor but he could not protect his position and fled for safety to Lahore, taking Kuh-i-noor with him. The Raja, Ranjit Singh gave him shelter but took possession on the famous Kuh-i-noor. Kuh-i-noor remained in the Toshakhana at Lahore until the annexation of the Punjab in 1849 at the end of the Second Sikh War, when the treasure came into possession of the East India Company, on whose behalf kuh-i-noor was presented to Lord Dalhousie to Queen Victoria on 3 June 1850. The diamond was shown at the Great Exhibition of 1851. The diamond was recut under the supervision of James Tennant in 1852 and the weight reduced from 191 to 108.9 carats. Kuh-i-noor was worn by Queen Victoria as a brooch, but after her death it was set in Queen Alexandra's brand-new diamond crown. Today kuh-i-noor is part of the Crown of Queen Elizabeth, however India believes that kuh-i-noor should return back home. "Koh-i-Noor new version copy" by Chris 73 / Wikimedia Commons. Licensed under CC BY-SA 3.0 via Commons. 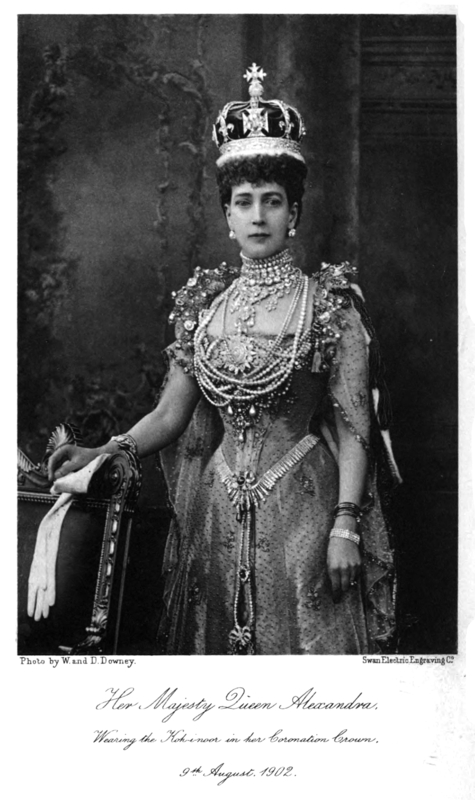 "AlexandraKohinoor" by Book by Sir Charles Lawson, photo by W. and D. Downey - Memories of Madras by Sir Charles Lawson. Photo by W. and D. Downey. Licensed under Public Domain via Commons.